Tending Perennials . . . Enormous Perennials . . . Some perennials are meant to stand unprotected throughout the winter months, the sculptures in our garden chief among them. Of course special attention is required, from time to time, to stave off the ravages of the elements. So conservation efforts will soon be in full swing as we tend to those most in need of a little TLC, while some works enjoy a fresh perspective having received the loving touch of our conservators late last season. In addition to the annual cleaning and waxing of each artwork, here’s a run down of recent and upcoming conservation efforts. 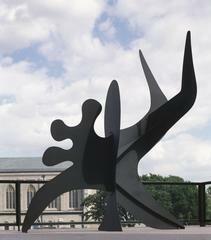 Frank Gehry’s Standing Glass Fish, the centerpiece of the Cowles Conservatory Palm Room, was repaired by re-adhering and replacing many of the 1,200-plus glass scales that cover the 22-foot sculpture, and Alexander Calder’s playful mobile The Spinner recently had a broken “arm” repaired after a particularily violent storm. David Nash’s Standing Frame also received attention – an improved foundation now ensures greater stability. 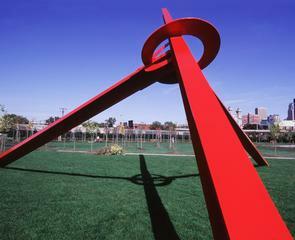 Slated for work in the weeks ahead are the repainting of Mark di Suvero’s soaring blaze-red Molecule and Alexander Calder’s Octopus stabile as well as The Spinner. Of course the most dramtic restoration effort will involve Claes Oldenburg and Coosje van Bruggen’s iconic Spoonbridge and Cherry.